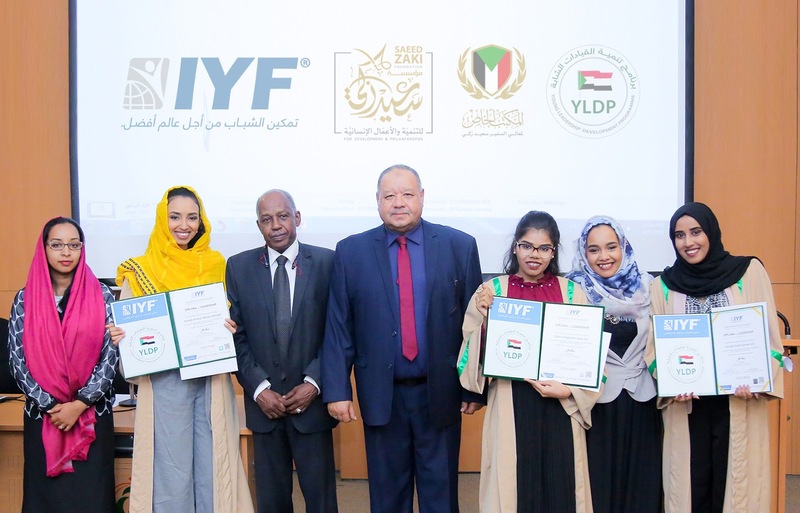 (Khartoum - IYF Sudan): On Thursday, 7 February 2019, the International Youth Federation in Sudan celebrated the graduation of the third batch of its Young Leadership Development Programme in Khartoum, Sudan. In his Speech, during the ceremony, His Excellency Major General Ahmed Awad Al-Gamal, Chairman of the Supreme Advisory Committee of the Programme praised the key role of youth in the development of societies. And he said: "The Young Leadership Development Programme and its efforts to motivate young people to develop their communities, and encourage them to create the future we want is actually very important to achieve sustainable development”. "The development of young people's potential in the field of leadership and innovation must be a priority in national development plans and also in international development cooperation, which we seek to do to achieve excellence," said Dr. Ethar ElTinay, Acting Chief Executive Director and Member of the Executive Council of the programme. Following the launch of the fourth session of the programme, IYF Representative in Sudan Dr. Rowan Faisal affirmed the continued support of the Federation for youth empowerment programs and initiatives. She said: The International Youth Federation through its main focus areas of capacity building, civic participation and innovation offer outstanding leadership, entrepreneurship, and employment skills programmes and a large number of other capacity building programs that seeks to highlight and emphasize on the role of young people in community development." "I take this opportunity to call for more local and international efforts and help young people to explore new opportunities and prepare qualified generations with the ability to innovate and achieve their dreams." Said His Excellency Ambassador Saeed ZAKI, IYF Secretary-General. The Young Leadership Development Programme (YLDP) is a dynamic and innovative programme, designed to empower Sudanese youth with the values, skills, and knowledge needed to succeed in future fields of work so that they are ready to use their potential to develop themselves and their communities and contribute to a better future for the country. This programme is one of the first and distinctive programs of its kind in Sudan which integrates the best theories of modern leadership with the strengths of professional experience by integrating participants into activities, presentations, discussions and various challenges to give them the skill and confidence to lead by example.